Here, instructions and recommendations on how to make your own plugin to go with the UMEP plugin will be described as well as tips and tricks on how to make use of the GIS capabilities included in QGIS to go with your plugin. Gary Sherman (creator of QGIS) has produced a number of useful tools for developers that can be used to make your own contribution to the software. Below, a number of tool are listed that come very handy when you want to create your own plugin. There is also a number of resources online that is very useful. One is the PyQGIS Developer Cookbook available from the QGIS webpage and another is a book written by Gary Sherman called The PyQGIS Programmer’s Guide. Start off by creating a plugin using the PluginBuilder in QGIS. This is a plugin that sets up all necessary files and folders for your plugin. Another useful plugin is the PluginReloader which makes it possible to reload a plugin in QGIS without restarting the software. pb_tool is another useful program to use for installing your plugin in the QGIS plugin folder as well as cleaning etc. Please use the python libraries that comes with the QGIS installation as much as possible without including external libraries when developing your plugin. All libraries are not included when a common installation of QGIS is installed. Go to our Getting started section for further instructions. The same goes for matplotlib and other libraries that you are uncertain of. The main file of the python wrapper for the SUEWS model is called SUEWSwrapper.py. To change version of SUEWS when running the wrapper, simple go in to SUEWSwrapper.py and activate the line which is calling the appropriate wrapper (e.g. SUEWSwrapper_v2016a) and comment out other versions. A possibility to make use of fortran subroutines in python. See here for documetation. When developing the fortran code for compiling with f2py kind=1d0 will not work for function parameters to be passed in from python. Should use KIND=8. Please note that the steps below contain some links that over time could change, however, the basics should remain the same. This has been tested and established for an Intel 64-bit machine running NT operating system. This is still to be tested on other versions of Windows operating system. If you carry out on both OS, please add to the list below or report to team. The process can also be applied to a 32-bit machine, but the choice of python2.7 and set up for MinGW-w64 will be different. This has not been tested, and perhaps shouldn’t be encouraged if SUEWS is being developed and tested on/for 64-bit architecture. Before starting any of the required steps it is recommended that any version of Python, mingw, and Cygwin be removed from the machine if possible. If you already have Python 2.7 and MinGW installed, or have followed the procedure below then go to the instructions on developing fortran-python interface. Note: The C:\Python27\Scripts directory is required for use of pip in subsequent steps. (iii) Check the directories for numpy and numpy-1.11.0rc1.dist-info are under C:\Python27\Lib\site-packages. Dates and times of directory should indicate these are new from wheel. Note: This is suitable for 64 and 32 bit architecture. Run mingw-w64-install.exe (found in directory to which you have downloaded it to). (ii) Set the destination folder to: C:\mingw-w64_x86 when prompted. This step is required to create/replace the import library found under directory C:\Python27\libs. The import library is libpython27.a. (i) Download the pexports binary pexports-0.47-mingw32-bin.tar.xz from here. Note: pexports-0.47 could change for subsequent versions. Unpack the tar file and put pexports.exe in C:\Python27\libs. Note: USERDIR is the user directory you put the file in. As it is an intermediary step and a temporary file, the user directory you use shouldn’t matter, however, don’t try to put it in Windows\System32 directory, or any other directory in the system Path. Create the import library libpython27.a for helping the linker of MinGW link to the correct python DLL. (i) Open Command Prompt and change directory to where python27.def was created in step 8 (i.e.USERDIR*). Note: This should be called from within the directory that the Makefile and source code is in. Note: A .pyd file should have been created on the completion of compilation from command called in step 1. Create a directory to store all created .pyd files in (e.g. C:\PythonPYD) and add to PATH environment variable. This ensures the .pyd files are picked up and used by python scripts. Note: all the .dll files (including those used to make python library from MinGW) need to be packaged up so that a machine without MinGW can use the developed python libraries. SolweigShadow as SS* will enable you to access the functions of the module by SS.functionName(). Note: The parentheses are needed regardless of whether the function has parameter inputs/outputs. If you are interested in contributing to the code please contact Sue Grimmond. : CHARACTER(len = 10) :: group  ! group: datetime, default, ESTM, Snow, etc. Demonstration that the model performance has improved when new code has been added or that any deterioration is warranted. Install NetBeans from www.netbeans.org. You only need to download the C/C++ version. If you don’t have the correct Java, follow the link presented to you and install correct version. Copy your code to a folder of your choice. Create a new project (C/C++ from Existing Source) and use you folder as the project folder. Keep all other settings. You are ready to work. In Netbeans, go to Tools>Options>C/C++ and click Edit next to localhost. Click Add… and write metcl2. Just keep on clicking until you need to give your username and password for the cluster. Now you should be able to run GNU on the cluster from your windows PC. Install python 2.7.X, 64 bit from python.org (Windows x86-64 MSI installer). Install with default settings. Visit JetBrain, Pycharm website and obtain a student account (go to Discounted and Complimentary Licenses, https://www.jetbrains.com/pycharm/buy/). Click on For Students and Teachers, go to bottom of the page and click Apply Now. Choose either a student or a teacher status. You will get an email where you activate your license. Create a folder which you can use as a project folder. Copy the python code (*.py) from the suews repository and put it the folder. If you don’t have access to the repository talk to Fredrik Lindberg. Download PyCharm professional (https://www.jetbrains.com/pycharm/download/) and install. Start PyCharm and activate license using your JetBrains account. Create a new project (Pure python) and choose the created folder (3) as your project folder and use your python installation as interpreter. Click ok in the next message box. Go to File>Settings >Project Interpreter. Add a new package by clicking the green plus sign. Search for numpy and install package. If you get errors, you probably need correct version of Visual studio. There is an address of a website where you can download it in the error message when you tried to install numpy. Run mainfileLondon.py to do stuff. Go to qgis.org and click on download. Choose the installation for advanced users (64-bit). Choose the advanced desktop installation and make sure that qgis-ltr is included. Keep other default settings. This give you a python installation with everything you need (pretty much). IF you are missing python libraries after the installation, you can restart the installation file and add more components. If you haven’t installed PyCharm, follow set 2 through 5 above. In PyCharm, add the pip package (if not already there). See bullet point 6. Above.7. Go to http://www.lfd.uci.edu/~gohlke/pythonlibs/ and download the appropriate py2exe package (.whl). All files and folders needed are now created in a subfolder call dist. You also have to add the SUEWS executable and all files needed to run the model. This is for advanced users regarding SUEWS Prepare plugin in UMEP. The information in should help with translating the plugin, adding new tabs or adding new variables. excel documents SUEWS_init.xlsx, SUEWS_SiteLibrary.xls and SUEWS_SiteSelect.xlsx. as a part of the plugin in the folder named “Input” (by default in C:\Users\your_username.qgis2\python\plugins\SUEWSPrepare\Input). for example to generate the amount of site library tabs and the contents of those tabs. any changes made to these documents will be lost if they are replaced (e.g. reinstalling or updating the plugin). This can be prevented by making backups of the excel documents before reinstalling or updating. This file handles the amount of site library tabs in the plugin, the name of these tabs and their connection to other excel sheets and text documents. Each sheet represents one tab. This file contains all the different information connected to different site. Each excel sheet is connected to a different kind of information like vegetation and water data and each line in a sheet represents a different area or site. This information is used to determine what kind of information and variable will be present in a widget of a site library tab. Fig. 8.1 Empty widget not connected to any sheet from the SUEWS_SiteLibrary document. This file contains an example of one line of output from the plugin. It is used by the plugin to check the order of the outputs. It can be considered the least important and useful for developers. How to work with the excel documents to make changes to existing information inside the plugin such as titles. This could be required for translation or to fix spelling errors. The SUEWS_init determines the number of site library tabs as well as the number of widgets in these tabs and where the widgets will fetch their content. The document contains a number of sheets and every sheet represents one site library tab. The names of the sheets will determine the title of the site library tab. The first one is an example of how the layout of a working sheet should look. Fig. 8.2 Example of the layout of a sheet in the SUEWS_init document. Each row of a sheet represents a new widget. Every column of the row is used to determine the specific characteristics of the widget. 1 The content of a widget such as variables are determined by a sheet from the document SUEWS_SiteLibrary (See #XLS). The first column of a row in a sheet in SUEWS_init makes the connection between a widget and a sheet in SUEWS_SiteLibrary. This means that the content of the first column will be the name of a sheet in SUEWS_SiteLibrary. 2 As well as being connected to a sheet in SUEWS_SiteLibrary each tab needs to be connected to a text document. This text document will basically be a copy of the site library sheet and will be part of the plugin output. All available text documents are located in the folder named “Output” in the plugin directory and will have the same name as the sheets in SUEWS_SiteLibrary. The contents of the second column will be the full name of a text document including the file extension, for example “SUEWS_Veg.txt”. 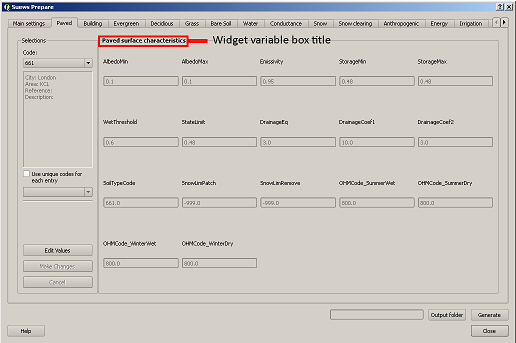 3 determines the title of the widget’s variable box. 4 optional and determines if there is an identification code for the widget. The identification code is an integer number is used when multiple widgets share a site library sheet but shouldn’t share the same site entries. If an identification code is added the widget will only fetch site entries that match the code. If no identification code is need the column is left blank. 5 determines if there is a default site entry that should be selected in the widget’s drop down menu when the plugin is initiated. If the site code of a site entry (see #XLS) is added to the fifth column this site entry will be automatically selected in the widget on plugin start up. 6 When the plugin generates an output each widget will provide the selected site code in the widget as part of the output. The sixth column is the index of the site code in the plugin output. It should not be changed without careful consideration as there is a risk of the site code overwriting other information in the output if it is. Fig. 8.3 Red outline illustrates the title for the widget variable box. A widget’s contribution to the final output of the plugin will be the selected site code in the widget. This code will be placed somewhere on a predetermined place in a long list of variables. The sixth column in a SUEWS_init sheet represents this position in the final output. 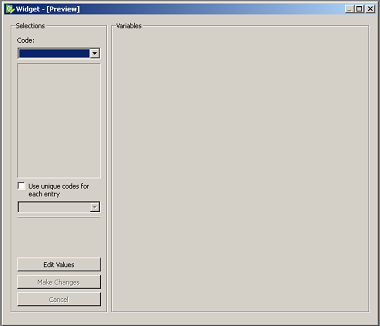 To change a widget’s output order edit the number in the sixth column. Take care to make sure changing the position doesn’t overwrite any other information. The order of the final output is also closely tied to the document SUEWS_SiteSelect, see more [[#XLSX]. The name of the tabs in the SUEWS Prepare main window correspond to the names of the sheets in the excel document SUEWS_init. To edit a tab name simply change the name of the sheet. What can be made through the SUEWS_SiteLibrary.xls. The SUEWS_SiteLibrary document is what defines the variables inside a tab. This document defines the titles and tooltips for the variables as well as the values for the variables on different sites. Fig. 8.4 Different rows of a site library sheet highlighted with different color. For the variable title row and the site entry rows the different purposes of the columns have been illustrated. first row of a site library sheet is an index of the variables in the sheet. second row contains the titles of the variables. The first cell is always the title “Code”. After all the variable titles follows a blank cell. The cells that follows will be titles for metadata, it is also possible that there is no metadata for the sheet. The row always end with the titles “Photo”, “LC_previous” and “LC_code” in that order. third row contains tooltips or longer descriptions of the variable titles. A site entry represents one complete set of values for all the variables in the sheet. One row represents one site entry. The first cell of a site entry always contains the site code. This code is used to differentiate between different site entries and needs to be a unique integer number for the sheet. The following cells contain values for different variables until an exclamation mark marks the end of variables. If there are any metadata descriptions these will be in the cells following the exclamation mark. The last three cells are in order: a photo url if there is one otherwise the cell is left blank, a blank cell and lastly the identification code if there is one (otherwise the cell is left blank). The two last rows: The two last rows of the sheet contains a single “ -9” in the first cell. These rows are used by the plugin to signify the end of the data in the sheet and nothing below these rows will be read. To change the title of a variable, first navigate to the correct sheet in SUEWS_SiteLibrary. The titles of all variables are decided by the text in the second row. Replace the text in a column to change the name of a single variable or for example translation purposes replace every word in the second row with its translation. The tooltip of a variable is a longer description than the title that shows up when the user hovers over the variable text box. Fig. 8.5 Tooltip of a variable. The third row of a SUEWS_SiteLibrary sheet defines the tooltip of a variable. To changes it, replace the text for the relevant column in the third row. The document SUEWS_SiteSelect.xlsx is mainly connected to the final output of the plugin. Most developers won’t need to make any changes to it. Developers mainly concerned with the layout of the SUEWS Prepare plugin will not need to be concerned about SUEWS_SiteSelect. The second row of the sheet SUEWS_SiteSelect contains text strings that are used by the plugin to identify a variables place in the final output of the plugin. Changing the order of the strings in the second row will similarly affect the final output. How to make additions to the plugin (e.g. adding new tabs). Earlier information will be useful when adding to the plugin. i.e. read earlier sections before reading this one. As discussed (#XLSX) the excel document SUEWS_init.xlsx is closely tied to how the plugin generates tabs. The plugin will generate tabs according to the number of sheets in this excel document and according to the information in the sheets. A single sheet represents one new tab. Every row in a sheet represents a widget that will be added to the tab. Every column in a sheet contains certain information that decides the specifics for a widget such as what variables will be added. The first sheet of the excel document is an example sheet that can be used as a quick reference for the content of the columns. For a more detailed description see #XLSX. Create a new sheet in the SUEWS_init document. The order of the sheets will match the order of the tabs in the plugin. Do not place the sheet first in the excel document as this is used as a placeholder for the example sheet. The name of the sheet will become the title of the tab. Add the name of a sheet from the SUEWS_SiteLibrary document to the first column. This will be what decides the content of the first widget in the tab. See #ADD if there is a need to create a new sheet for the tab. Add the name of a text file that will receive the output of the widget to the second column. In most cases the text file should have the same name as the sheet from step two. Make sure to add the file extension, for example .txt, to the second column as well. The content of the fourth column is optional. This column contains a code that can be used if multiple tabs share a sheet from SUEWS_SiteLibrary. The code is used to identify what site entries belong to which tab and widget. (See #XLS) Leave the column empty if no identification code is needed. The content of the fifth column is optional. This column can be used if there is a site entry in the sheet from step two that should be selected in the widget’s drop down menu by default. Enter the site code of a site entry in the fifth column to make it the default. Note that the site code is not the same as an identification code (See #XLS). Leave the column empty if there is no default site. The sixth column represents the index of the widget output in the order of the plugins final output. The widget output will be the site code selected in the drop down menu. Make sure that the index doesn’t overwrite an already existing output. The easiest way to make sure of this is to check the document SUEWS_SiteSelect for the index of the last variable and use the index after the last variable. To add more widgets to the tab, follow the instructions from step 2 and forward again on the following rows of the sheet. As discussed in #XLS the variables of a site (and consequently the variables that appear in a widget connected to this site) are generated from the excel document SUEWS_SiteLibrary. One sheet represents the variables of a type of site and can be connected to multiple widgets and tabs. A new site sheet must fulfil certain conditions. The first row of the sheet should be an index of the variables in the sheet that ranges from one to the amount of variables. The second row should contain the titles for the variables and the first column should always be “Code”. Furthermore the second row should always end with the titles “Photo”, “LC_previous” and “LC_code” in that order. The third row should contain longer tooltips or descriptions of the variables. The rows following the third row should each represent one site entry. Lastly the sheet should end with two rows that just contains “ -9” in the first column. For a more detailed description see #XLS. The first entry should be the site code for the entry. This needs to be an integer unique for the sheet. The column following the last variable needs to contain an exclamation mark designating the end of the variables. If there are metadata titles for the sheet the information for these should be entered in the columns following the exclamation mark. Metadata is optional for all site entries. For the last three mandatory titles; the “Photo” column can contain a url link to a picture representing the site entry. The “LC_previous” column can be left blank. The “LC_code” column can contain an identification code if this is needed for the site entry. Create a new sheet in the excel document SUEWS_SiteLibrary. If you know how many variables the sheet will contain start numbering the first row of the sheet from 1 in the first column to the amount of variables in the last column. Otherwise fill in this row when all the variable titles have been entered. The numbering should end where an exclamation mark would be entered for a site entry. Add the variable titles in the second row. Start with “Code” in the first column. Leave a column blank where the exclamation mark for a site entry would be entered. If there are any metadata descriptors relevant for the site add the title for these after the blank column. Examples of this could be “City”, “Area” or “Description”. After adding any metadata descriptors add “Photo”, “LC_previous” and “LC_code” in the last three columns of the row in that order. Add the tooltips of the variables to the columns in the third row. These should be longer descriptions of what the variable represents. OPTIONAL: Add any site entries manually to the sheet. Use a new row for each site entry. The other option is to use the plugin to add all the entries. One benefit of using the plugin is that the site entries will be added automatically to the text document as well as the excel sheet. Add “ -9” to the first column of the two last rows of the excel sheet. Create a text document in the “Output” directory of the plugin. Name it after the excel sheet if possible. Make a copy of the variable index in the first row of the sheet as the first line of the text document. Use tab indents as a replacement for columns. Make a copy of the variable titles in the first row of the sheet as the second line of the text document. Use tab indents as a replacement for columns. Copy any manually added site entries in the sheet to the text document. Each site entry is a new line in the text document. Use tab indents as a replacement for columns. End the text document with two lines, both only containing a single “ -9”.